I garden on a yard that is about one third of an acre. Most of the land is in the back yard and is maintained as a semiformal garden of trees, shrubs, perennials, and beds for annual vegetables. The front yard is very small (about 45’ x35’) and is located on a busy state highway. Until recently the front yard was very shady because of three street trees, so I planted shrubs that could at least take partial shade, mainly a bottlebrush buckeye (Aesculus parviflora), but no fruiting plants because there wasn’t enough sun to bother. Though not my first choice, beach plum has become a reliable addition to my landscape. 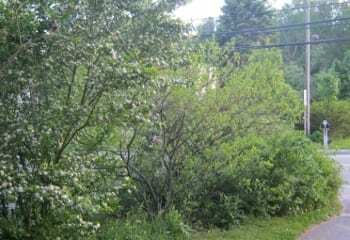 But the area has a southwest exposure that was too good to waste so I looked to the margins of the front yard beyond the street trees for planting opportunities. That had me considering the stretch of land that, as anyone who lives on a busy road in a snowy area knows, is a desert because of the salt and sand that accumulates each winter. I decided to look at beach flora for plants that will tolerate the conditions that generally only crabgrass had found appealing. Since I’ll never own a beach house, I also liked the idea of pretending I was at the beach without having to deal with the traffic to Cape Cod. Beach rose seemed a possible alternative for a difficult strip alongside a highway. 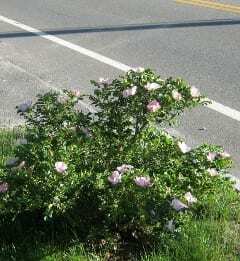 I started with two beach roses (Rosa rugosa), a white and a pink, placed about four feet from the road. I thought of how pretty they would be, plus the rose hips would be a source of vitamin C. They didn’t die, but they were not too vigorous so I added another rose. I have forgotten the name, but it has been very vigorous and straddles the line of being too vigorous. Then I bought some beach plum (Prunus maritima) whips from Oikos Tree Crops and planted them next to my mailbox. Even though they received weekly deep watering that first summer, they were slow to establish because it was such a dry environment next to the asphalt. However, they survived and produced some fruit despite their small size. I was then surprised to find a beach plum at Home Depot. That was a more sizable plant than the whips and has grown to about 7’ by 7’ over eight years. It produced a great crop of plums two years ago, and I decided it was worth my while to pick a container of the fruit (mainly inspired by a beach plum crisp recipe I found on this blog: http://efgcookery.blogspot.com/), instead of just eating them one by one when I passed by while mowing the lawn. The large beach plum is about 10’ from the street and in a bed with the roses so the environment is less stressful than it was for the whips, which I planted in the lawn with small mulch circles. 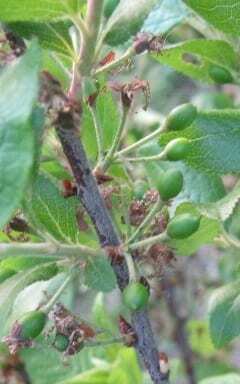 Beach plum sets fruit in June that is ready to eat in July. The beach plums whips by my mailbox were continuing to get stronger and stronger, despite at least five years of winters being buried in snow banks with salt and sand, when the real danger came: the Massachusetts Department of Transportation (MassDOT). The intersection near my house was being widened, and I asked at a public meeting if my street trees were going to be cut down. The engineers assured me there were no plans to cut down my trees. I knew the beach plums would not be a factor in the road planning so I didn’t ask about them. I hoped I’d receive notice if the construction workers needed them moved, but also knew that was wishful thinking. Each day during the road construction that I returned home to find them safe I was happy. But then the curbing went in, and I returned home to find no trace of the plums in the re-graded soil by the mailbox post. After that I planted some more beach plum whips from Oikos in the newly hydroseeded strip by the road where they were thriving after two years. Then I made the mistake of reporting one of my street trees as a potential hazard to MassDOT. With no discussion, the state came six months later and took down two of my street trees, altering my whole landscape. When I called the state to express my dismay, I was told they were not my trees. I couldn’t get an answer from them about how much of the land in front of my house was theirs though apparently they were happy to let me mow their grass under their trees. To avoid continued losses, I moved the beach plums further back in the yard and abandoned the state land to crabgrass. Winter moth caterpillars are particularly fond of beach plums. With luck, someday I’ll have a beach plum hedge blocking out the road. In the meantime the next beach plum enemy has arrived at my house from the East, winter moth (Operophtera brumata, http://www.massnrc.org/pests/pestFAQsheets/winter%20moth.html). The male moths flew to my house two years ago, and the females arrived by crawling or other transport (they don’t fly) last year. The winter moth caterpillars love plants in the rose family, and based on my experience with the beach plums at the Wellesley College Botanic Gardens, they seem to particularly love to defoliate beach plums. 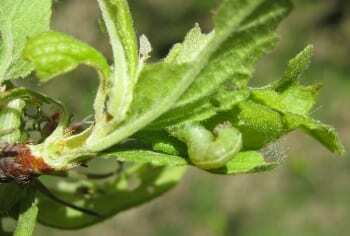 The caterpillars can be controlled by less toxic pesticides like Bt (Bacillus thuringiensis ) in the early caterpillar stages and spinosad, a pesticide derived from bacteria that works on a variety of insects including moth and butterfly caterpillars. I don’t spray any of my other fruit trees, but since the beach plums are small I may spray them if the defoliation is severe enough. By spraying, I’ll hope to carry them through to a time when a natural enemy of the winter moth arrives, as it did for gypsy moth, in the form of an insect, virus, fungus, or other pathogen. One of the advantages for me of having the beach plums in the front yard is that they are somewhat isolated from the moister, more crowded back yard where pests like squirrels and black knot disease of cherries and plums (Apiosporina morbosa) have no trouble moving from plant to plant so at the moment winter moth is the only pest problem I have. 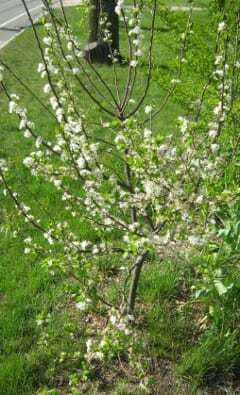 Though not particularly ornamental, beach plum produces small white blossoms in May. Beach plums can get big (up to 12’ high in gardens) and they can send out runners, but if they are in a mown space that shouldn’t matter or it may even be desirable in a larger semi-formal area. Small white flowers cover the plants for a brief time in May, but it’s not particularly ornamental. It does produce fruit which to me makes up for its lack of beauty. It’s also a native fruiting plant which should place it high on the list for edible landscaping. Because beach plum is adapted to difficult ocean side conditions, being in a regular garden setting with ample moisture and fertility might make for less than ideal growing conditions as it does for plants like bearberry (Arctostaphylus uva-ursi) which need open sites with well-drained soil. Having conditions too good may make the shrub more susceptible to disease, but I can’t speak from experience on that. Beach plums thrive on the margins of land whether seaside or on a suburban road, so despite having had some problems (manmade and natural) I recommend planting them if you have a difficult site. Tricia Diggins is the Senior Gardens Horticulturalist at Wellesley College where she has taken care of the Arboretum/Botanic Garden for nearly 20 years. She began her horticulture career as an intern at New England Wildflower Society’s Garden in the Woods in 1990 several years after earning a B.S. in Environmental Sciences at UMass Amherst. When Tricia isn’t caring for the plants at Wellesley College, she is developing and maintaining a third-of-an-acre edible landscape. Tricia may be reached at pdiggins@wellesley.edu.